Ask.com gleefully tells me that the average adult has over 5 million hairs across their entire body. With that visual picture, it is time to imagine the 8 year old of your choice enacting on a plan to single-handedly rip out all 5 million hairs, INDIVIDUALLY! To make matters worse, this sly and deviant child has the ability to slide away every time you are just about to catch him. Do you have the kid pictured yet? I know I do. This sort of torture is on that bizarre pain threshold where for some reason I like to pretend like “It is not that bad ” or “I can get used to it.” Those two phrases for me are huge smoke signals that I am totally deceiving myself about something. This “not that bad” kind of tale I would tell myself was exactly what the wintertime felt like in my current city of Chungli, Taiwan. It did not matter the hour of the day, or the day of the week. It was always raining just enough outside to make you furious, and it was also JUST cold enough that you would freeze your a#* off in a sweatshirt. Matters were normally complicated further by the fact that a jacked just seemed like too much for some reason. SO ANNOYING!! The good news is that I made it out of the winter alive, and without killing anybody. My life, and the weather, also recently took a drastic change for the better. The feeling of the child poking at you has been replaced with abundant sunshine and hot summer days. There is another reason besides the weather things started going so much better. I finally blasted from my head the voice and visual memory of my mother looking me in the eye after my Uncle Bill died in a horrendous motorcycle crash in 1987. I can still see the tears streaming down her face like a gentle waterfall, and she was shaking like she was about to go into some sort of horrible convulsions. I shook my head yes since I just didn’t want to see my mother hurting like that anymore.This was one of those obligatory promises that you make as an 8 year old that you never think you are going to hold yourself to. I didn’t have quite such good luck with this one exiting my conciousness. It somehow stayed with me for 26 magical years. This meant anytime I got within 300 feet of anybody I knew with a motorcycle that I would tense and prepare for an onslaught of excuses and lies to tell if I was asked to ride on it. Unfortunately, promises sometimes just have to be broken. 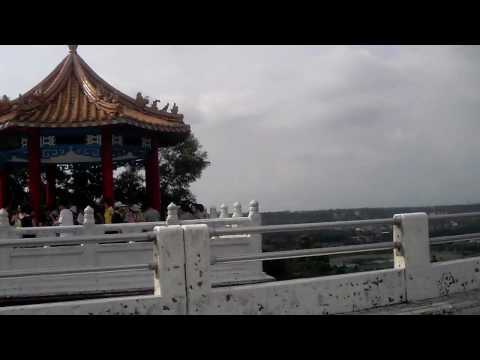 I had been on the island of Taiwan since November 1, 2012 without using my own transportation. After breaking this 26 year promise, I finally started driving the blue and gray Yamaha 2003 scooter I bought about 4 months previously. The scooter and the utter chaos of Taiwan traffic somehow went from absolutely terrifying to extremely fun in less than two weeks of making gradually extended commutes. This newfound courage gave me the idea to go on a much needed adventure. It was time to take the scooter out for a little spin. My personal favorite kind of adventure is when I have absolutely no plans of where I am going to go That was the beauty of this trip I was about to embark on.. So, I grabbed my silver hand me down helmet and the left the friendly confines of my apartment in exchange for the open road without a care or a plan in the world. My future afternoon plan became solidified fairly quickly into the trip. 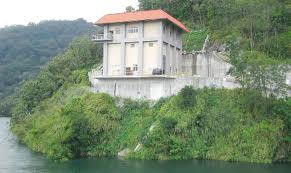 I remembered when I first got to Taiwan when a friend of mine took me with her and some of her other friends to this place called Shimen Reservoir. I had a small idea of where this place actually was. The first trip was during the winter time and to nobody’s surprise the weather was cold and rainy, and you couldn’t really see anything. I luckily decided to give it another shot. After 45 minutes of winding through Taiwan’s often treacherous center-city traffic, the golden moment finally arrived. The sudden lack of traffic gave me the opportunity to ease off my Darth Vader style grip on the scooter for just a moment. That is when I even took a glance to the right on Route 3, and noticed a 10 foot high jungle looking set of rice paddies They were mildly blowing back and forth in the wind. I realize that the vision of rice paddies waving back and forth doesn’t normally equate to people’s National Geographic’s top 5 sites. This picture personally could not have struck a better feeling in my own body. After what seemed like an absolute eternity of winter time rain this year, I knew that it was finally an opportunity to explore some of Taiwan’s landscapes without the 7-11’s. Peace and quiet in a country that is the same size as Maryland or Indiana but has a population of 23.5 million is not to be taken for granted. I hate to dissapoint. 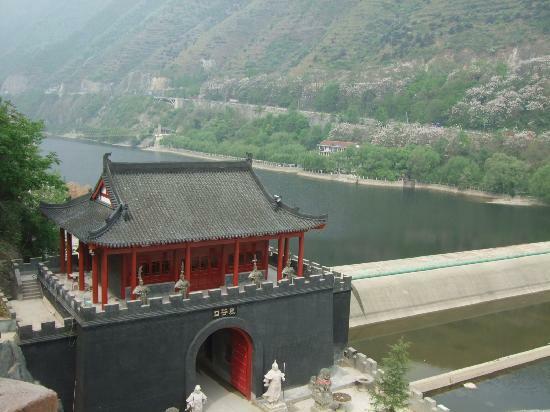 However, I still chose the more sane option of continuing on to my original planned destination of Shimen Reservoir. I also saw the sign that it was only 2 kilometers away. I probably finished the remaining 2 kilometers at an average speed of about 10kmh. I was so stoked to just not even be able to hear the trucks, beeping horns, or any annoying noise you could think of on the road. I was immediately surprised by the natural beauty of the Shimen Reservoir. I thought it would be nothing more than an overcrowded and polluted damn. I spent about 3 hours within the confines of the scenic areas taking little hikes, and driving my scooter to some of the most serene scenery I have ever seen. 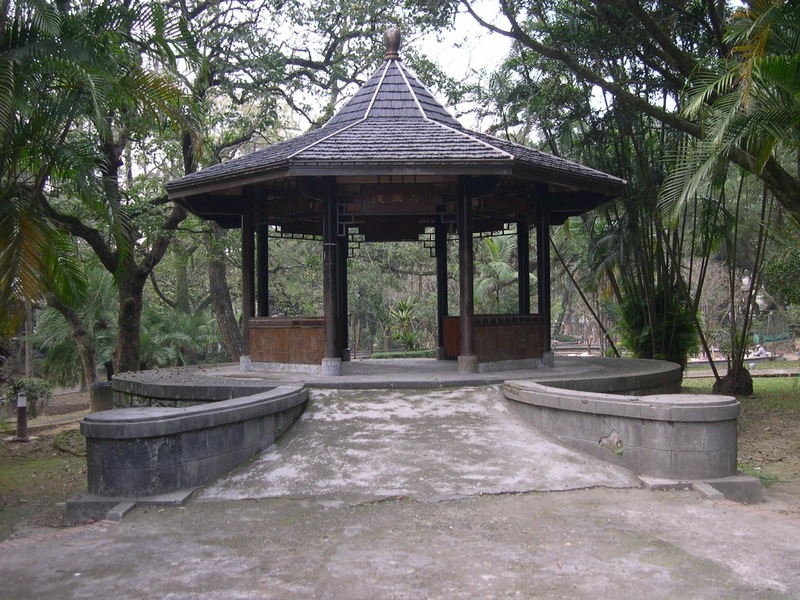 I sat on benches that looked like they were made of wooden bongos underneath a 1400BC style looking Chinese temple for a canopy. Like I said before, I felt like I am finally here in the Taiwan. The previous 6 months of drunken debauchery and every pretty girl I talked to could not even compare to the peace and serenity I felt as I gazed into a view of what seemed like hundreds of miles ahead. I could also envision the many opportunities that lie ahead for me in Taiwan. Afternoons like that give you hope that you never have to wake up and do something you don’t want to do. On a side note, many thanks for reading, I am considering moving the blog to my own domain name of intothetaiwan.com. How would you rate this name on a scale of 1-10? Please be brutally honest if you think it is lame. This entry was posted in Controlled Chaos, Driving a Scooter, Neili, Rice Paddies, Shimen Reservoir, Taiwan, Taiwan Traffic.